The construction industry is beginning to show signs of an economic recovery, according to a new report. For the first time since 2006, statewide private building permits have increased for three consecutive quarters, according to the University of Hawaii Economic Research Organization. UHERO forecasts that close to $3.4 billion in building permits will be issued in 2012, a 48 percent increase from almost $2.3 billion in 2011. The report says nonresidential permit growth has been driven by additions and alterations, due in large part to state tax credits for renewable-energy installations. Residential permitting also is increasing, up 20 percent since last year. UHERO Executive Director Carl Bonham said many of the permits are for home renovations, including photovoltaic installations. “That’s playing a large role in driving the permitting numbers,” he said. UHERO said the next home-building cycle is starting now, supported by the firming up of residential prices on Oahu. The residential real estate markets are improving the most on Oahu and Maui, with prices up between 6 percent and 8.5 percent. 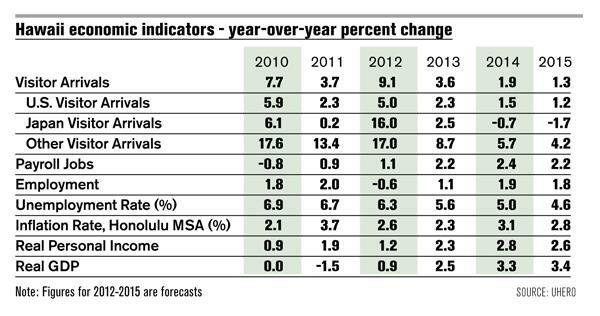 Smaller increases in the upper 3 percent range are occurring on the Big Island and Kauai. Tourism continues to lead the state’s economy, the report said. Visitor arrivals were up 10 percent in the first eight months of the year, nearly half-a-million more people than in the same period in 2011, and visitor days were also up 10 percent statewide. UHERO estimates that 7,825,700 travelers will visit the state this year, and that number will climb to 8,104,700 in 2013. Bonham said it’s still possible that there will be 8 million visitors this year. What will determine whether the state reaches the 8 million visitor mark, he said, is whether visitors will travel to the Neighbor Islands when Waikiki hotels are full. If you are looking to buy or sell something here on Maui or would like more information about Maui Real Estate please do not hesitate to contact me at 808-276-2004 or visit my website www.SoldOnMaui.Net to search the Maui MLS & check out New Listings and much more. Or e-mail me at trendi@maui.net and tell me what you’re looking for!